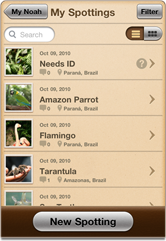 This app features almost 1000 species of bird species and thousands of images, with descriptions and information about behavior, habitat and appearance, this app teachers users all about birds. With exploring, and journal & photos features, this app teaches kids about animal habitats and the environment in general. The app also encourages kids to go out into their backyard and look for patterns and colors in nature or to take pictures to fulfill challenges. This river app allows users to go through simple assessment to see if their river is healthy. The app also allows collaboration between users to see where healthy or unhealthy streams are in their environment. GeoCaching introduces users to geocaching, with tips and information for everyone from beginners to experts. The app includes geocaching locations and an interface to interact with other geocachers. This app encourages users to move off screen and do activities to enjoy the different seasons, with activities ranging from jumping in leaves to rolling a snowball. The activities are presented on screen- then encourage kids to do them in real life! iNaturalist allows a forum to observe, record and share what you see in nature with other naturalists. Visual recognition software enables users to identify trees based on photos of their leaves. Through articles, videos, journaling and images, kids learn all about insects. The app then encourages kids to get outside and find insects in their own backyard. Also available in Forest Edition. NOAH stands for Network Organisms and Habitats. With this app, users can explore and document wildlife they experience and can share it with others to help document the world's biodiversity.